Our 1st and last days were spent in Kathmandu. 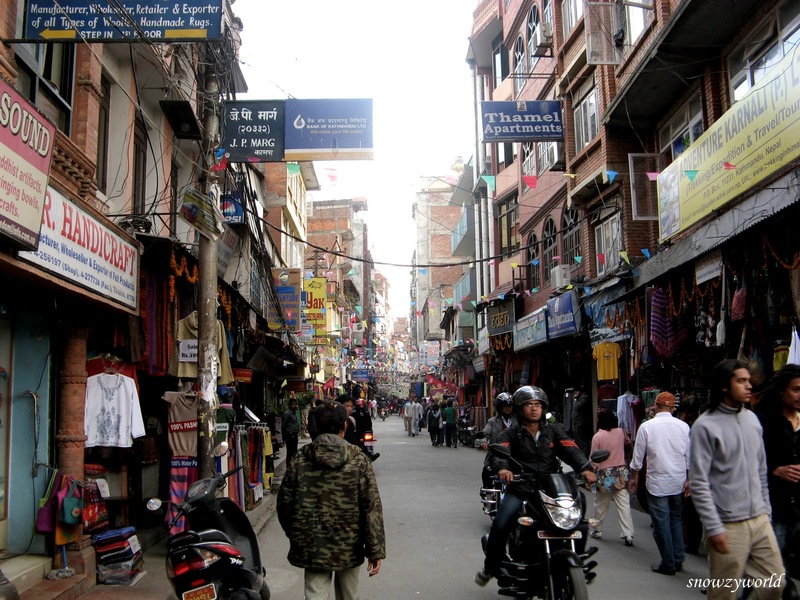 We stayed in the tourist area – Thamel. It was lined with hundreds of trekking shops selling almost like the real The North Face trekking items. Down jackets, trekking pants, boots, down sleeping bag, Leki trekking poles, you named it they have it. You can just come empty-handed and get all the items you need and start your trek. But I really don’t like Kathmadu, all the cars, motorcycles zooming past you on the street of Thamel. It’s so dusty, noisy from the honks… I just cannot fall in love with this town. The 1st day was like a maze and we just walk on the street of Thamel in circles without even realizing it. It was only on the last day that I actually got my bearings right. Well, it’s actually not all that bad, I liked the supermarkets, bakery and the biscuit shop there. On our 1st day at Kathmandu, Durga brought us to this temple, Swayambhunath Stupa. Took a cab there (cost NRs 200, I wonder if it is too expensive actually). It is atop a hill in the Kathmandu Valley, west of Kathmandu city. It is also known as the Monkey Temple as there are holy monkeys living in parts of the temple in the north-west. The Swayambhunath complex consists of a stupa, a variety of shrines and temples, some dating back to the Licchavi period. There is a Tibetan monastery, museum and a library. The stupa has Buddha's eyes and eyebrows painted on. Between them, there is something painted which looks like the nose - but is the Nepali symbol of 'unity', in the main Nepali language dialect. The site has two access points: a long stairway, claimed to have 365 steps (being everyday for a year?? ), leading directly to the main platform of the temple, which is from the top of the hill to the east; and a car road around the hill from the south leading to the southwest entrance. We walk up the long stairway, probably some warm-up for us before ABC trek?? Half-way a check point requesting only tourist to pay entrance fee of NRs 200.